City variations. Can you figure out what city is which logo? Full listing here. The old logo had already won by being a unicorn with glitter. The new logo builds on the winnings with a crisper rendition that streamlines the drawing with more straight lines and accentuated curves for a more confident rendition. 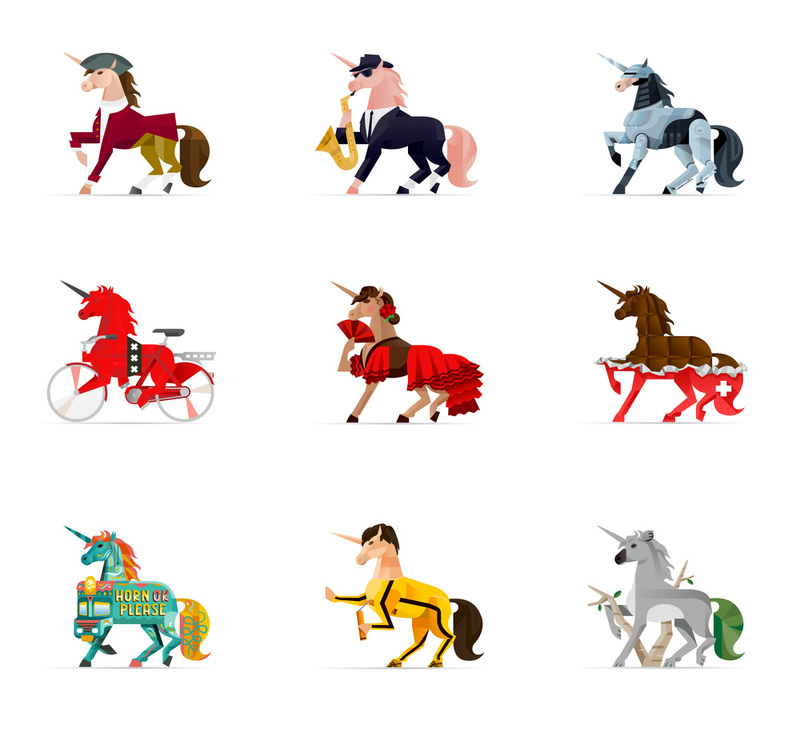 As a bonus, each city's office has gotten its own custom unicorn illustration that span the gamut from expected (bike and St. Andrew's Crosses for Amsterdam) to unexpected (Robocop for Detroit) and they are pretty awesome. Thanks to Dylan Schnurman for the tip. (Est. 2013) \"DigitasLBi is a data-inspired lead agency. We fuse creativity, data, and technology to help our clients transform their business. A top-ten global marketing and technology agency, DigitasLBi is comprised of 6,000 digital and technology experts across 40 offices in 25 countries worldwide. DigitasLBi is part of Publicis.Sapient a Digital Transformation Platform purpose-built to solve for the challenges of today's digital world -- where companies seek to become fully digital businesses. Publicis.Sapient is 23,000 people strong, across 100 offices in 50 countries.\"